Create custom Celtic, medieval and Renaissance designs for your wedding! Celtic, medieval and Renaissance designs for your wedding! It's NOT a lettering font (although we include one for free) - it's a design tool that creates patterns by typing! 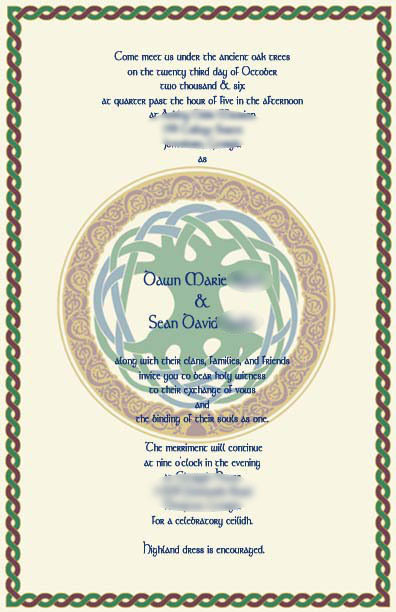 The Celtic Knot Font is perfect for wedding invitations, programs, table and thank-you cards and more. Create your own embroidery designs for a very special Celtic, medieval or Renaissance style wedding gown. Make patterns for decorating your cake with matching knotwork motifs. You can even use the Font to make backgrounds, borders and embellishments for a wedding scrapbook or photo album. 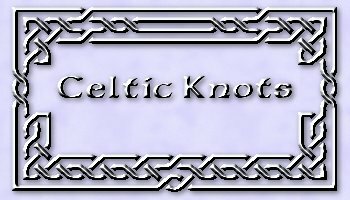 The Font lets you easily create unique Celtic knotwork on your computer - play with it until you get exactly the perfect design for your project - then print it! The designs are fully scalable so you can print them out at exactly the size you want. This True Type font works on any PC or Mac, in the word-processing programs you are already using, or in any program that lets you choose a font. 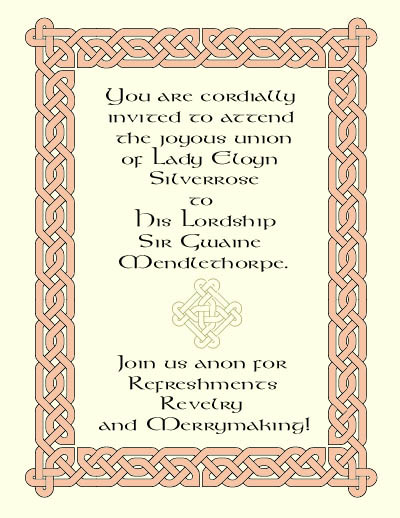 This invitation is an example of one of the ways that you can use the Celtic Knot Font in printed materials. This wedding invitation was created for some friends who were having a Renaissance style Wedding. The Filled and Outline Styles of the Font were used to create the border. The 2 styles align perfectly because of the great precision that was used in creating both of them. The subtle design in the center was also created with the Outline Style. These embellishments were created with the Font and then given the appearance of silver in Photoshop. This wedding invitation has an interlaced border made with the Font. This heart border created with the Font is perfect for weddings and would be lovely embroidered on a dress. These embellishments were created for a scrapbook. The following designs were created with the Font and then effects were added in various graphics programs. The following are examples of the various Styles of the Font used in an ordinary word-processing program like MS Word with no embellishments. 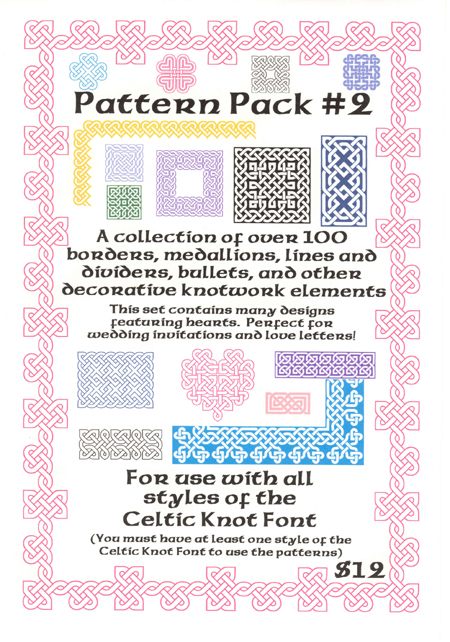 The Pattern Packs are accessories that work with any Style of the Celtic Knot Font. Each has over 100 fully editable royalty-free designs that you can use as-is or modify as desired with the Font. Vector based, they scale to any size and work perfectly in any graphics program as well. Pattern Pack #2 was specially created with a selecton of romantic knots appropriate for wedding invitations and programs, thank you notes, greeting cards, quilts, applique, hand or machine embroidery on wedding gowns, Irish dance dresses, Renaissance Faire garb and costumes, and even patterns for crafts. 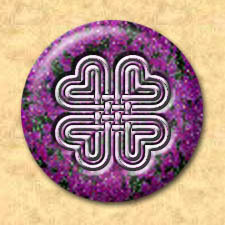 Many of the designs incorporate hearts. The package includes borders, medallions, hearts, and a variety of other decorative embellishments. You must have at least one Style of the Font to use the Pattern Packs. All of the designs work in all of the Styles. 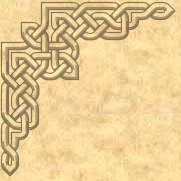 If you are looking for more traditional Celtic knots, try Pattern Pack #1. Click here to learn more about the different Styles of the Font! 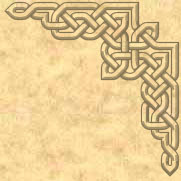 I have studied hundreds of Celtic knots and dozens of tutorials on how to make them. I have taken these knots and the techniques to make them and have distilled them down into a set of standard elements. I took those elements and converted them into a font. We will soon have charted graph versions for beadwork and cross stitch! Email us if you would like to be notified when they are available. 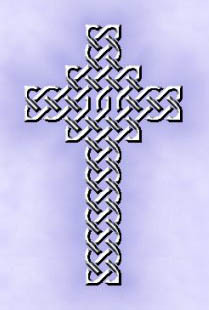 Click here to see examples of Arts and Crafts done with the Celtic Knot Font.